Virgin Atlantic and Virgin Holidays have simultaneously launched their new multimillion-pound marketing campaigns and brand identities that inject a sense of playfulness and magic back into the travel experience. The work is the first by Abbott Mead Vickers BBDO since it won the joint Virgin Atlantic and Virgin Holidays ad account in a hotly contested pitch against Omnicom stablemate Adam & Eve/DDB earlier this year. AMV was the Virgin Holidays incumbent, while A&E/DDB had previously worked with Virgin Atlantic. Following the review, AMV was tasked with developing complementary, but distinctive, marketing strategies for each brand. This is the first time the two brands have been aligned in their advertising. Both spots will launch in the same ad break during ITV’s The X Factor on Saturday (15 September). They have also pooled media budgets as well as planning and buying strategies, handled by PHD. The campaigns will run across video on demand, outdoor, press, radio, digital, mobile and social media. First to air will be Virgin Atlantic’s ad, "Depart the everyday", which brings to life the exceptional experience customers can have above the clouds. 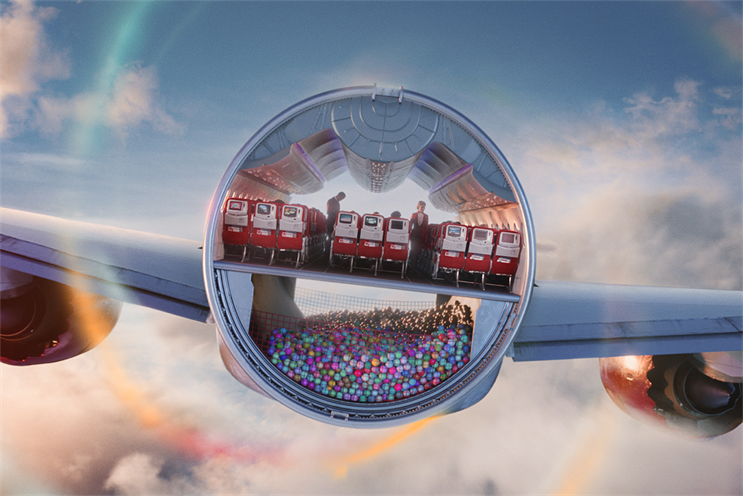 Passengers go on an otherworldly plane journey in which a boy dances on the ceiling, a ball pool sits below deck and the air vents serve rainbow ice cream. The cabin crew seen in the spot are all real Virgin Atlantic employees who auditioned for the roles. The work was written by Ben Polkinghorne, art directed by Scott Kelly and directed by Salomon Ligthelm through Stink. The Virgin Holidays ad, "The world is your playground", encourages people to view the world with wonder, playfulness and openness. It has similar fantastical imagery and surreal elements to the other spot, such as a man who rides a vintage muscle car down the Big Sur as if it were a skateboard, the Las Vegas strip placed within a pinball machine and giant paper boats floating in San Francisco’s bay. Both ads share a common character, an exuberant boy. "The world is your playground" was written by Michael Hughes, art directed by Dalatando Almeida and directed by Dante Ariola through MJZ. Since the creative review, the marketing teams of Virgin Atlantic and Virgin Holidays have also started working closely together. This arrangement is more logical because a lot of customers already think they are the same brands, Claire Cronin, senior vice-president of marketing at Virgin Atlantic, told Campaign. Although the brands are distinct, they are both aimed at "customers with flair", she added. The mass democratisation of travel has also meant a mass dehumanisation of it, Cronin explained, so Virgin Atlantic wants to "show how fantastic the experience is, no matter where you are on the plane". She continued: "People want their holiday to start sooner, and to arrive feeling refreshed rather than frazzled from the experience." Similarly, Virgin Holidays offers an invitation to escape mundanity and stress. "We want to take people out of the every day. The world is open to you; go grab it and have a sense of play," said Amber Kirby, marketing and customer director at Virgin Holidays, adding that the brand wants to get back to connecting emotionally with people through its marketing. Also this week, Virgin Holidays set up what it claims to be the biggest outdoor ball pool in the UK. The activation will run during 13-14 September at Observation Point on London’s South Bank.